Polycoat is ColourCourt’s unique polyurethane binder process. A cost effective renovator which impedes the deterioration of surfaces beginning to suffer from the breakdown in the bitumen binder. The surfaces are first pressure-washed clean, then the Polycoat is applied binding the remaining surface, and finally two coats of non-slip acrylic are applied to give an aesthetic, safe and long lasting finish. 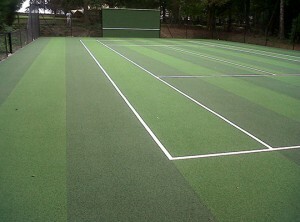 Colour Spraying ColourCourt use a high quality water based acrylic paint, consisting of one undercoat and one top coat in Tennis Court Grade HG4 paint. These are formulated to be slip resistant, containing algaecide and fungicide treatments. Great care is taken with all mixing ratios and controlled carefully as any variation can affect the finished quality of the coatings. Optimum use of pigments can result in deep, intense colours.